Baby & Child motor development: #2 from 2 month old to 1 year! Baby & Child motor development: from 2 month old to 1 year! After last week blog post about primitive reflexes in new-born, we now present “normal” motor evolution during the first year of your baby. Sitting: your baby can hold his head for a few second and then fall on the side. Your infant is unable to stabilise is spine/trunk at this point and will just collapse on himself. On his tummy: your infant can maintain himself on his forearm and lift his head at 45°. Hips bones are kept flat on the floor and his legs extended. On his back: your infant start to stretch and flex his legs and arms and to be passionate by his own hands! Your baby bring his hands together, can take a tissue place on his face and start to reach for toys placed close to him. Sitting: if you help your baby by holding his hands he can now pass from lying to sitting. He lifts his head and bend his legs to sit. Your baby can grab objects between his palm and his last 3 finger and bring it directly to his mouth! Held standing up, your baby try to jump! Held in standing position: your baby jump and can also squat! Rolling on the side is now the best way to move around the room for your baby! 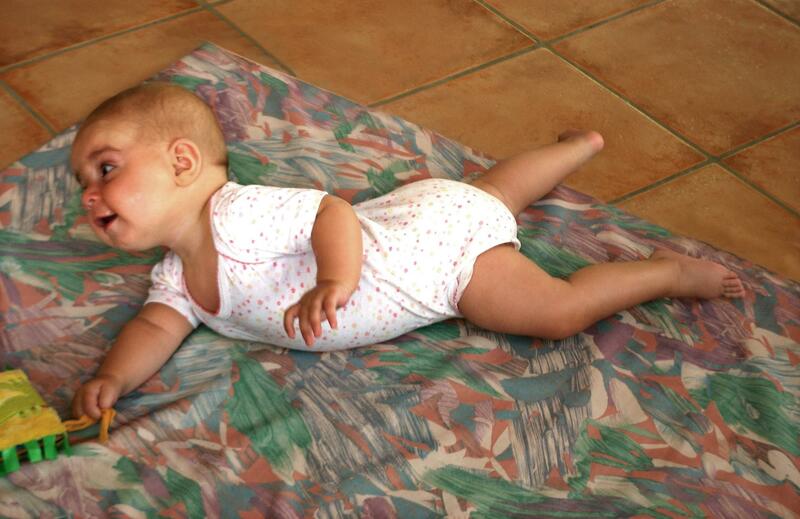 On his belly: your infant starts to crawl, even if at first it is easier to go backward! Some babies actually let themselves fall when they realise they are not holding anything! This summary of “normal” motor evolution in infants is only indicative what happen in general and presents element we look at (as paediatric physiotherapist) when performing a neuro-motor evaluation. The absence of one of these elements is not suggestive in itself of an issue. Additionally, we often have parents coming for a physiotherapy assessment telling: “my cousin baby’s or the neighbour child was already walking or crawling at his age”, yet it doesn’t mean there is a delay or a problem. Every child is different and progress as its own pace. So when evaluating motor development, paediatric physiotherapist are often more interested by the order motor skills have been acquired and if there is any barrier to further progress rather than the exact age. There are even babies who never crawl! Not because they can’t but often because they find another way to move around (rolling on the side or pulling themselves with a leg staying sit cross legged). And yet they will learn to walk without any issues! In any case, if you are worried about your baby motor development speak about it with your GP, paediatrician or paediatric physiotherapist!